Former Oasis star Noel Gallagher is to headline a special benefit concert to reopen Manchester Arena next month. The venue has been closed since the bomb attack at an Ariana Grande concert on 22 May, which left 22 people dead. It will reopen on 9 September with a fundraising show featuring a number of north-west acts. 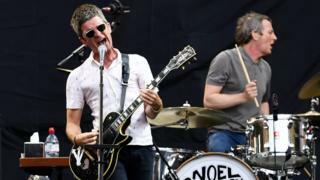 Noel Gallagher's High Flying Birds will be joined by indie bands The Courteeners and Blossoms, 1980s pop star Rick Astley, and poet Tony Walsh. Walsh captured the spirit of the city when he performed his poem This Is The Place at a vigil the day after the attack. Gallagher's appearance will also have particular significance - his song Don't Look Back In Anger became an anthem of unity in the wake of the bombing after a crowd started spontaneously singing it at a memorial. The Courteeners also performed it when they played to 50,000 fans at Old Trafford cricket ground five days after the atrocity. Gallagher's brother and former Oasis bandmate Liam appeared at the One Love Manchester benefit concert a week after that, but Noel did not. More acts are still to be announced for the arena reopening concert, which is titled We Are Manchester. All profits will go towards establishing a permanent memorial to the victims, which will be built by the new Manchester Memorial Fund. Tickets for the show, costing £25 and £30, will go on sale at 09:00 on Thursday 17 August. There will be extra security and ID checks, and fans have been asked not to bring bags larger than 35cm x 40cm x 19cm. Councillor Sue Murphy, deputy leader of Manchester City Council, said: "No-one will ever forget the terrible events of 22 May but Manchester has reacted with love, solidarity and a determination to continue doing the things which make this such a vibrant city. "We welcome the reopening of the arena, a major venue which attracts hundreds of thousands of visitors, as a powerful symbol of this defiant and resilient spirit." Renovation work has been taking place in the venue's foyer, where the bomb was detonated. The arena's general manager James Allen said: "May's events will never be forgotten, but they will not stop us - or Mancunian music fans - from coming together to enjoy live music. "Manchester Arena has celebrated over 20 years hosting some of the greatest musical talent of all time, and the significant economic and cultural impact that this has on the city means that this legacy must continue. "Public safety is always our priority and we are doing all we can to keep people safe at our venue."